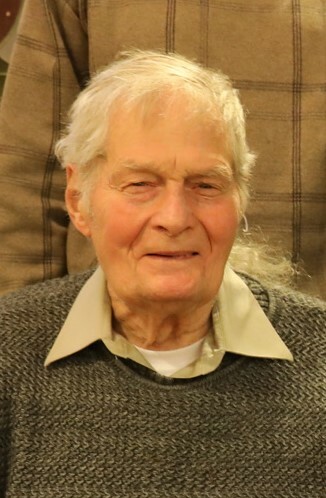 George Webster Plank, 91, Kokomo, passed away at 11:42 am Tuesday, February 5, 2019, at his home surrounded by family. He was born December 22, 1927, in Rochester, New York, the son of the late Ray & Marian (Leland) Plank. On November 9, 1968, in Shoals, IN, he married Jacqueline “Jackie” Edwards, who survives. George was a 1946 graduate of Delphi High School and attended Tri State College. He served with the United States Army. George retired from Chrysler Corp as an Electrician. He was a member of UAW Local #685, Naphtali Masonic Lodge #389, IBN Saud Grotto, Indianapolis Valley of the Scottish Rite, and Grace United Methodist Church. He volunteered for the Automotive Heritage Museum, and was also a member of the Pioneer Auto Club. George enjoyed traveling, antique cars, and everything relating to history. He cherished the time he spent with his children and grandchildren. Along with his wife Jackie, George is survived by his children, Robert M. Plank, Jessica (Greg) Horoho, and Brenda Leap; grandchildren, Donald Martin (Lucinda) Krieg, Samantha (Francis) Murphree, Jennifer (Ted) Metz, Michael (Alexandra) Wolfe, Tyler Horoho, and Dax Horoho, along with 7 great-grandchildren; brother, Robert L. (Shirley) Plank, and several nieces and nephews. George was preceded in death by his parents; children, George Joseph, Angela Margarette, and William Arthur; great-granddaughter, Abigail Burch; sister and brother-in-law, Margaret (Stan) Delikat; and his first wife, Beverly Jean Hamon Plank. Services for George will begin at 4:00 p.m. Sunday, February 10, 2019, with military honors provided by the United States Army and the Greentown American Legion at Grace United Methodist Church, 219 W. Mulberry St., with Masonic Rites and the funeral services immediately following, with Pastor Susan Hobson officiating. Private burial will be held in Crown Point Cemetery. Friends are invited to visit with the family from 2-4 p.m. Sunday at the Church. Memorial contributions may be made to Grace United Methodist Church or to the American Heart Association. Messages of condolence may be left online at www.shirleyandstout.com.